Yesterday, Sling announced a deal in partnership with Amazon to offer you either a free Fire TV Stick or 50% off the Fire TV when you signed up for three months of their new Sling TV service. While that’s a heck of a deal, especially for those looking to rid themselves of rising cable costs for a more slimmed down TV package, it forces Android fans to buy into Amazon’s line of Fire TV devices. That’s not the worst thing in the world, but what if there was a similar deal for something like say, the Nexus Player, Google’s new media box? According to Sling’s website, there will be, soon. As of today, the Nexus Player is only listed in Sling TV’s supported devices section as “coming soon,” along with the XBOX One. If a current promo page already on Sling’s site is anything to go by, “soon” may be sooner than you think. 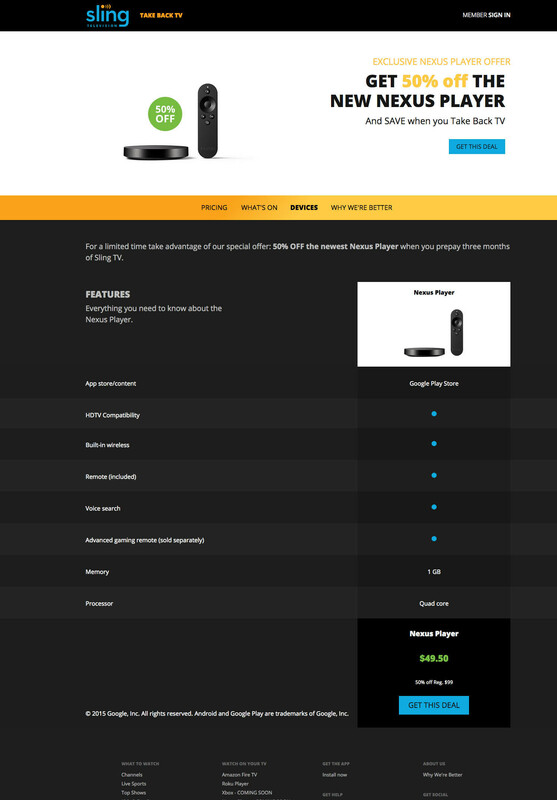 The promo page speaks of a deal that will land you 50% off the Nexus Player when you sign up for three months of Sling TV service, just like with the Fire TV. The deal doesn’t appear to be fully live yet, which would make sense since the Nexus Player still hasn’t been announced as a supported device. You can view the deal here, but the “Get This Deal” button is broken at this time. In case Sling pulls it, we’ve included a screenshot of the details below. So if you were holding out on Sling TV until the Nexus Player gained support or because you didn’t want to own a Fire TV device, don’t worry, your time is coming…soon.